Heavy rains falling in the night have become the norm here. Flashes of lightning that appear brighter and more ominous than their real distance occur a few times a week. We’re lucky to have the rain. The garden is the better for it. . . although I noticed that the weeds have benefited from the rain as much as the flowering shrubs and bushes. After I put the laundry in this morning, I took my garden shears outside and looked around to see what I could find for a bouquet to grace our kitchen table. Afterwards, I took the bag of Granny Smith apples and the corn on the cob that have been waiting patiently in the bottom of the fridge. I like cooking in the mornings during the summer. 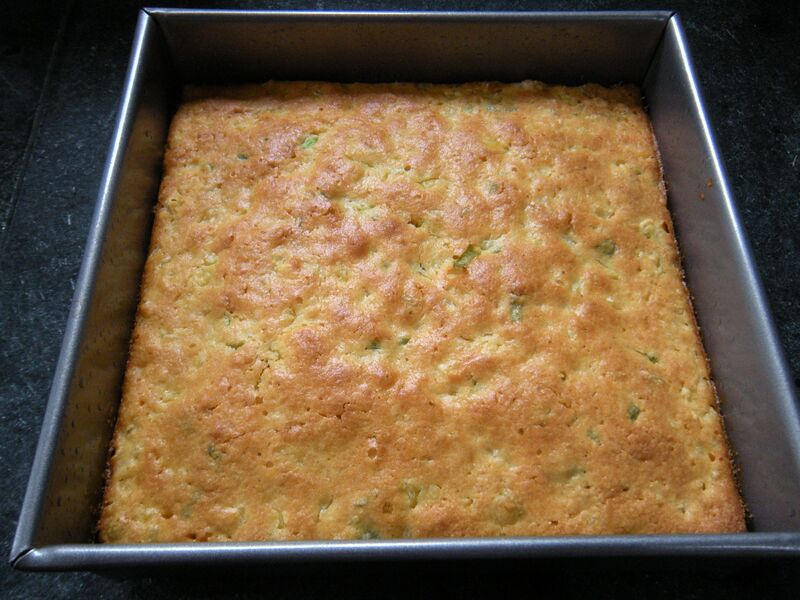 Before you know it, there’s dessert ready for dinner as well as some cornbread made with the corn, sliced off the cob cooked in a little butter with some chopped up green onions after it’s cooled. 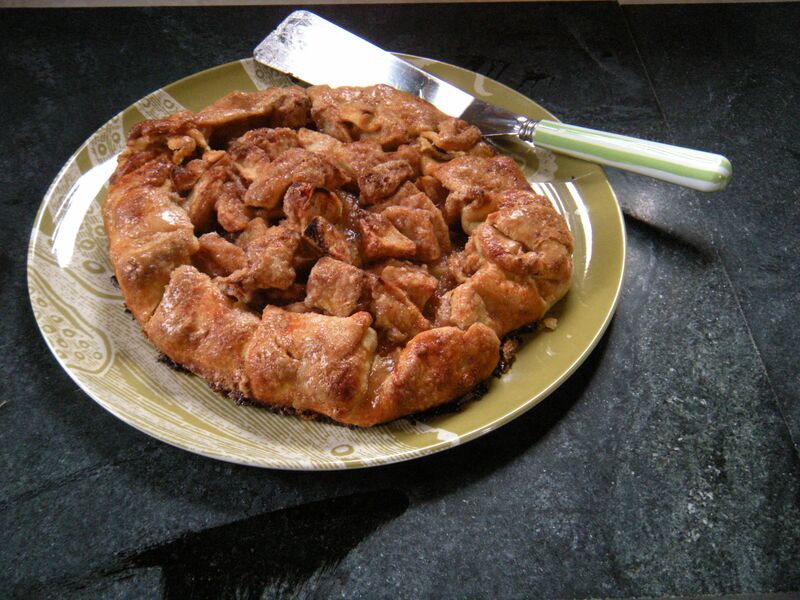 Will send some of the apple pie and the cornbread across the street to G.’s mother who is ninety-three. Mmmm, simple things! Rain in the night, fresh flowers from your own yard, fresh baked pie and homemade cornbread. And, sharing with a neighbor. I love that–“looked around to see what I could find”–and you “find” that beautiful bouquet. 🙂 If I went outside, all I would find is basil, oregano, and rosemary, some very wilted looking petunias and periwinkles, and some kind of little pansy. Summer is taking its toll here. Thanks but you give me too much credit! 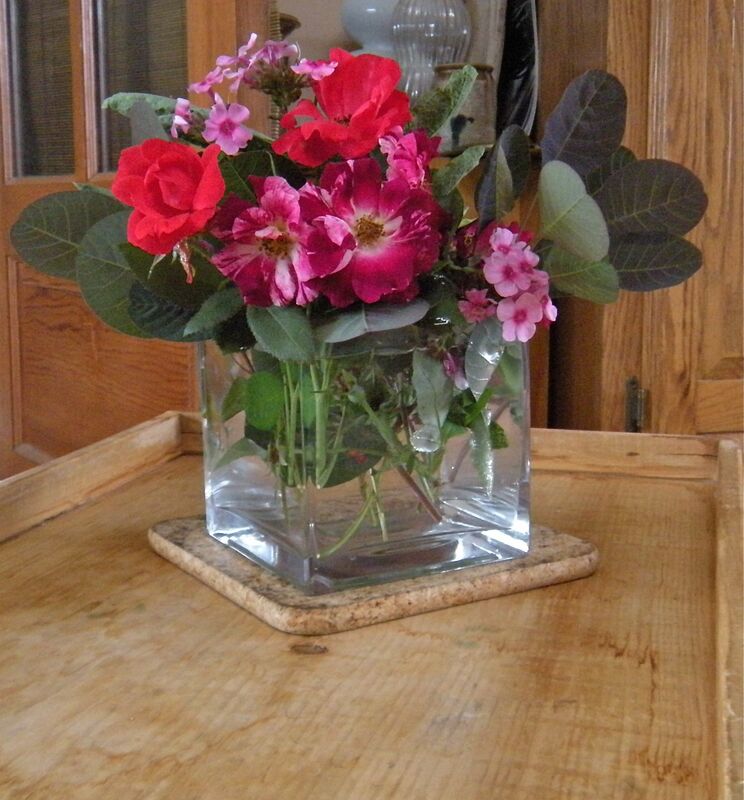 I just about decimated anything that looked good to come up with that small square vase of flowers! There’s also some tired looking echinacea and some hydrangea that doesn’t look the way I thought it might when I planted it. And, a humongous growth of Chinese lantern plants in the front garden that has run amok, spreading its feelers while we haven’t been looking. Hard to eradicate but stunning when harvested. Can’t have it all, I guess! Do you have a small container like a stoneware ink bottle or a glass one? because you could make a charming little “posy” with your pansies and herbs–would look sweet on the windowsill or in the bathroom? Great idea! I have a small glass canning jar that was my grandmother’s, and it has a little metal “handle” on it, and beach stones from South Africa in the bottom, which could act as a frog!